At the top level, England is divided into nine regions. Each one containing one or more county-level areas. The regions were created in 1994 and since the 1999 Euro-elections have been used as England's European Parliament constituencies. All have the same status. However London is the only region with any devolved power in the form of an elected mayor and the Greater London Authority. The regions also vary greatly in their areas and their populations. England is divided by the Lieutenancies Act 1997 into areas for the appointment of Lord Lieutenants, who are historically the Crown's representative in a county. Although not actually defined as such, these areas have become known as ceremonial counties. These counties are sometimes used by people when describing where they live in England. However, many are not used as local government areas themselves, as many are too large or include large urban areas. They are taken into consideration though when drawing up Parliamentary constituency boundaries for example. 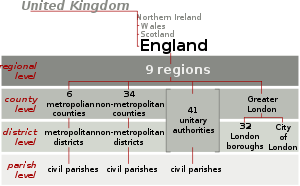 For administrative purposes, England is divided into four types of county-level subnational entities used for local governance. There are six metropolitan counties, divided into metropolitan boroughs, which cover large urban areas outside London. They were created in 1974. In 1986 their county councils were abolished. The "shire counties" were also created in 1974 and are legally known as non-metropolitan counties. They are divided into non-metropolitan districts and cover much of the country, though mainly the rural areas. Unitary authorities were created in the 1990s and are single-tier authorities which combine the functions of county and district councils. They are defined either as counties consisting of a single district or districts of a county such as Berkshire that has no county council. The Isle of Wight is the exception, being a county council with no districts. Greater London was created in 1965 and is sometimes considered as a metropolitan county but it is not defined as such. It is divided into the City of London and London boroughs. Shire counties are divided into non-metropolitan districts. Power is shared with the county council, but shared differently to the metropolitan counties when first created. The following are exceptions to the general arrangements for local government in England and as a consequence are separately listed in legislation from the above types of local authorities where functions are allocated to particular groups of local authorities. In Greater London, the 32 London borough councils have a status close to that of unitary authorities, but there is also a higher strategic tier, the Greater London Authority, which oversees some of the functions performed elsewhere by Counties including transport, policing, the fire brigade and also economic development. As well as the same general functions performed by the surrounding London boroughs, the City of London has others which make it distinct from most local authorities, including extraterritorial possessions (such as Hampstead Heath and Queens Park recreation ground in Kilburn) and services (including veterinary services at Heathrow Airport and domestic asbestos disposal) elsewhere in Greater London. Inner Temple and Middle Temple are small liberties within the boundary of the City of London which function as their own local authorities. The Isles of Scilly have a sui generis local authority, the Isles of Scilly Council, which is similar to a unitary authority found in the rest of England. Counties and unitary authorities of England assuming Option 2 had been chosen in all three northern referendums. A referendum was held in North East England on November 4, 2004 to see whether people there wished to have an elected regional assembly. As part of the referendum, voters were to have been asked to choose which system of unitary authorities they would like to see in the existing county council areas if the regional assembly was approved. In the event, the vote in the North East was a decisive "no", making the proposed local government changes moot. Most of the proposed changes would have required no change in the county level entites, as they could have been be implemented by merging districts and abolition of the county council. Where borders were crossed, however, changes would have been needed. This impacted Lancashire, where various parts were proposed for combination with Blackpool and Blackburn with Darwen (both unitaries), Sefton (in Merseyside), Wigan (in Greater Manchester), and southern Cumbria; it also affects one proposal for North Yorkshire, which would have merged the district of Selby with the East Riding of Yorkshire. Few of the boundary changes would have involved creating new borders - only the proposals to combine Blackpool with parts of Wyre, and to split West Lancashire between Wigan and Sefton would do this. [*] - the Boundary Committee is asked to advise whether an alternative unitary proposal for Norwich based on revised council boundaries could deliver the required improvements. [**] - if Bedford Borough Council’s proposals are implemented other authorities in Bedfordshire including Bedfordshire County Council will be invited to propose a unitary solution for the remaining area of Bedfordshire. ↑ Communities and Local Government - Woolas announces sixteen successful bids for unitary status to improve local services. 27 March 2007. ↑ Communities and Local Government - Healey announces nine successful unitary proposals. 26 July 2007. This page was last changed on 30 March 2015, at 09:13.